District Education Authority M.B Din has announced 581 Educators and Assistant Education officers Jobs in Daily Khabrain Newspaper for those candidates who have passed NTS (National Testing Service) Exam dated 27 December 2017 to 30 December for Educators/AEO’s 2017-18 Policy for contract basis. Jobs Categories are as Follows. ESE (Arts) 138 Jobs, ESE (Science) 168 Jobs, ESE (Arts) 31 Jobs, SESE (Science) 62 jobs, SESE (PET) 47 jobs, SESE (Arabic) 22 jobs, SESE (Drawing) 44, SESE (Com Sci) 06 Jobs, SSE (Arts) 13 jobs, SSE (Sci) 23 jobs, SSE (Com Sci) 16 jobs and Asst. 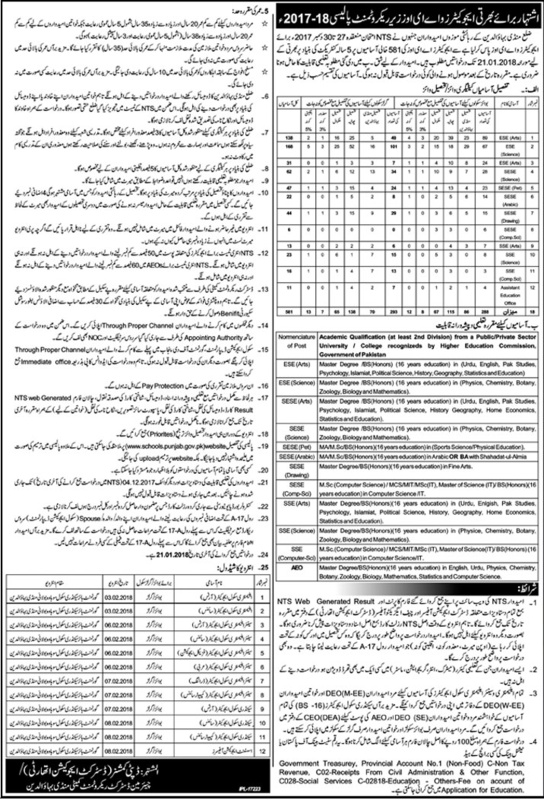 Education Officers 11 jobs.. Candidates shall submit their NTS (National Testing Service) application print form with all relevant attested documents to the concerned District Education Officers and Chief Executive Officers before given time and date. Those candidates who have third Division at Matric, Inter, Graduation or Master level are illegible. Male Candidates can only apply for Boys Schools and Female Candidates can apply only for girl’s schools. Only District M.B Din Domicile candidates can apply for these jobs.